Please read the full details of the LockeyUSA Warranty Policy listed below. All Warranty Claims must be processed through LockeyUSA. Warranty Claims processed through LockeyUSA Distribution Partners, or any other entity are NOT valid. To request a Warranty Claim Form, please Contact Us. All Lockey mechanical keyless locks are covered by a Lifetime Mechanical Warranty. The LockeyUSA Lifetime Mechanical Warranty covers manufacturer defects to the lock. The Lifetime Mechanical Warranty does NOT cover the finish of the lock or defects resulting from vandalism, and improper installation or use. Use of a non-synthetic lubricant may damage your lock and will not be covered under warranty. Additionally the Lifetime Mechanical Warranty does not cover lock tampering. Any attempt to remove the 'Silver Screws' to repair or manipulate the mechanics of the lock, will VOID the Warranty. 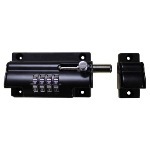 The Lifetime Mechanical Warranty applies only to Lockey keyless mechanical locks. The Lifetime Mechanical Warranty does NOT apply to key override (KO/KA) locks or any other Lockey product that includes a keyway. 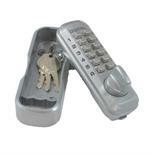 Lockey mechanical keyless locks with the key override (KO/KA) option are covered by a Limited Lifetime Warranty. The LockeyUSA Limited Lifetime Warranty covers manufacturer defects to the lock. The Limited Lifetime Warranty does NOT cover the tailpiece/spindle, including, but not limited to, damage, bends, breaks and/or modifications to the tailpiece/spindle. The Limited Lifetime Warranty does NOT cover the finish of the lock or defects resulting from vandalism, and improper installation or use. Use of a non-synthetic lubricant may damage your lock and will not be covered under warranty.​ Additionally the Lifetime Mechanical Warranty does not cover lock tampering. Any attempt to remove the 'Silver Screws' to repair or manipulate the mechanics of the lock, will VOID the Warranty. IMPORTANT: Please read/follow installation instructions closely. The warranty may be void if the Silver Screws are removed, or if the lock is not kept in the 'Clear' position while the code is being changed. The LockeyUSA Lifetime Mechanical Warranty and Limited Lifetime Warranty cover Lockey mechanical locks manufactured after December 31, 1999. The LockeyUSA Lifetime Mechanical Warranty and Limited Lifetime Mechanical Warranty do NOT cover mechanical locks manufactured on or before December 31, 1999. Warranty Claims will only be processed when the product is returned to LockeyUSA by the original Purchaser (at Purchaser's sole expense), accompanied by a LockeyUSA Warranty Claim Form and valid proof of purchase. Important: Please read/follow installation instructions closely. Failure to follow instructions and properly install the product may result in the void of warranty. Warranty Claims will only be processed when the product is returned to LockeyUSA by original Purchaser (at Purchaser's sole expense), accompanied by a LockeyUSA Warranty Claim Form and valid proof of purchase. Important: Please read/follow installation instructions closely. Warranty may be void if the hydraulic gate closer is installed improperly, if the opening angle of the hydraulic gate closer is not restricted to 100 degrees or less (gate stops are recommended), or if the hydraulic gate closer operates in temperatures less than 15 degress Fahrenheit and/or temperatures greater than 100 degrees Fahrenheit. Warranty Claims will only be processed when the product is returned to LockeyUSA by the original Purchaser (at Purchaser's sole expense), accompanied by a LockeyUSA Warranty Claim Form (including installation measurements) and valid proof of purchase. Important: Please read/follow installation instructions closely. Warranty may be void if the TB950 Magnum Hydraulic Gate Closer and Hinge is installed improperly or if the hydraulic gate closer and hinge is operated in temperatures less than negative 40 degrees Fahrenheit and/or temperatures greater than 100 degrees Fahrenheit. Warranty Claims will only be processed when the product is returned to LockeyUSA by the original Purchaser (at Purchaser's sole expense), accompanied by a LockeyUSA Warranty Claim Form and valid proof of purchase. All Lockey Panic Hardware including Lockey Panic Bars and Panic Shields come with a Five-Year Mechanical Warranty. The Five-Year warranty does NOT cover damage or defects to the product's finish, or defects resulting from vandalism, and improper installation or use. The Warranty does not apply to DETEX Panic Hardware, sold by LockeyUSA. All DETEX Warranty inquiries must be directed to the manufacturer.